A leading Turkish defense contractor has set a record with the world's largest rocket artillery, the company announced on Sunday. 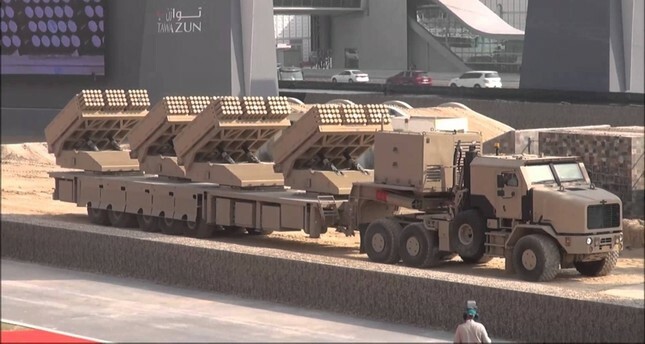 Jobaria, a multiple cradle rocket launcher developed by Roketsan for the United Arab Emirates (UAE), has racked up a Guinness World Record for the world's largest rocket artillery in terms of the number of barrels, the company said in a statement sent to journalists. The system, considered the world's strongest 122-millimeter artillery rocket system, has four rocket launchers attached to a 10-wheeled semitrailer, each carrying a 122-milimeter rocket. This artillery rocket system can fire 240 rockets at targets with a maximum range of around 37 kilometers (23 miles). The rockets can destroy an area of four square kilometers. Roketsan has been active in the UAE since 2003, exporting various products and taking part in defense projects. The Jobaria launcher was first displayed in 2013 at the International Defense Fair in UAE's capital Abu Dhabi. Roketsan, owned by the Turkish Armed Forces Foundation (TAFF - TSKGV), was ranked 96th by the "Defense News Top 100," a prestigious list published every year by the U.S.-based military publishing company, Defense News magazine, based on the sales of the previous year. Roketsan had a turnover of $376 million in 2017. Eastablised in 1988, Roketsan started production in 1992 under the scope of the "Stinger European Joint Production Project." Since then, the company has launched various unique projects and the rate of domestically developed projects and products has reached 87 percent. Last year Aselsan, Turkey's leading defense company also owned by the TAFF, had revenues of $1.4 billion, up from $1.2 billion in 2016. It is active in military and civil telecommunications, radar, electronic warfare, defense, weapons, and command and control and navigation systems. Aselsan was ranked 55th in the Defense News Top 100 list.